Mike’s practice focuses on insurance defense and civil litigation. He also represents individuals, small businesses, and large corporations in business and commercial litigation, including shareholder disputes, fair dealership, non-compete agreements, and copyright/trademark infringement. Mike is licensed to practice in Wisconsin and Minnesota. He has tried cases before judges and juries in state and federal courts. 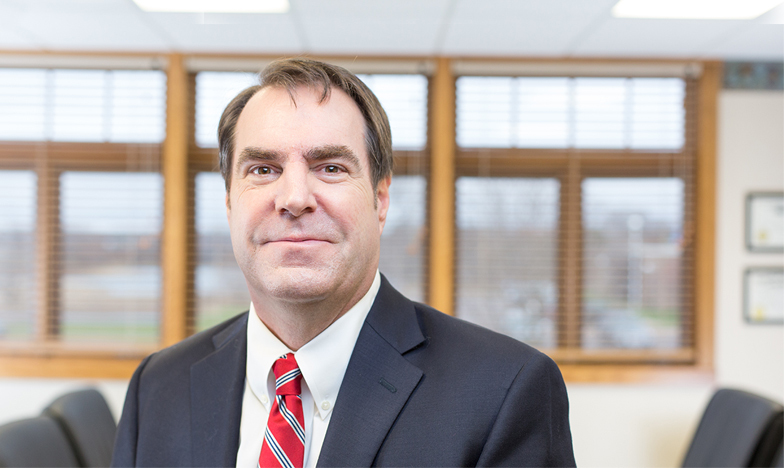 Mike has also argued appeals before the Wisconsin Supreme Court and Court of Appeals, the Minnesota Court of Appeals, and the 7th Circuit Court of Appeals in Chicago. Outside of the office, Mike has served on numerous charitable, business, and professional boards, including Chippewa Valley Habitat for Humanity (president), Literacy Volunteers of the Chippewa Valley, Friends of Sacred Heart Hospital, Eau Claire Golf and Country Club (vice president), Charter Bank Business Advisory Board, American Bar Association, Wisconsin Bar Association, Eau Claire County Bar Association (president), and the Wisconsin Defense Counsel. Mike also volunteers his time at the local free legal clinic and the Flying Eagles Ski Jumping Club. An Eau Claire native, Mike received his BSBA degree in finance from Creighton University and a J.D. from Creighton Law School. In his free time, he enjoys reading and playing golf.